Activate by R-clicking on an empty area of the desktop, or using "Super key + spacebar". You are encouraged to explore the menu, especially the Help options - many questions can be resolved there. What isn't answered there, please search the forums, and if it is still unanswered, ask your question in an appropriate area on the forum. nb. The basic Openbox menu does not automatically update if you install applications. For a dynamic menu you could activate the debian menu, or use a 3rd party application such as obamenu. "Menu -> Help & Resources -> Bunsen Help Files -> How to edit menu"
The gui menu editor is obmenu: "Menu -> Preferences -> Openbox -> GUI Menu Editor"
In order to keep the size of the initial installation down, you can choose to install various applications from the menu (GIMP and LibreOffice for example). These Install options only appear if the applications have yet to be installed on your system, and the menu will then automatically include them. A terminal window will open for the installation procedure. Tint2 theme can be changed with the Tint2 Chooser script: "Menu -> Preferences -> Tint2 -> Tint2 Chooser"
There is an alternative Tint2 config shipped with BunsenLabs, and you can add your own to "~/.config/tint2/"
"Menu -> Help & Resources -> Tint2" provides links. tint2conf is the gui editor included in the jessie-backports version of tint2, although using a text editor to modify an existing tint2rc is not difficult. "Menu -> Preferences -> Conky"
"Menu -> Help & Resources -> Conky" provides links for configuration. Set with nitrogen, accessed with "Menu -> Preferences -> Choose Wallpaper"
The window decorations and settings are set by Openbox. 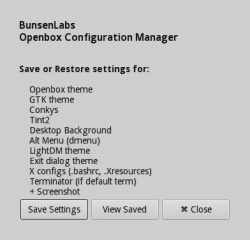 Change the theme with the obconf Openbox Configuration Manager: "Menu -> Preferences -> Openbox -> GUI Config Tool". GTK themes, fonts and icons can be set with lxappearance: "Menu -> Preferences -> Appearance"
BunsenLabs has the gui Synaptic Package Manager: "Menu -> System -> Synaptic Package Manager", but using apt or aptitude on the commandline is worth learning. Package details - source, versions etc - can be found with "Menu -> Help & Resources -> Debian -> Package Search"
Heed the warnings on the website and in the bl-welcome script! Remember that you had to enter "I understand", to say you are aware of the risk of system breakage if you use non-Debian or non-Stable sources. The Run box is gmrun, started with "Alt-F2". Commands can be entered here, and like in the terminal you can use tab for auto-complete. "Menu -> Preferences -> gmrun"
The Alt Menu is dmenu, started with "Alt-F3". The default dmenu opens along the bottom of the screen, and blocks other actions until you use "Enter" or "Esc". Any executables in your $PATH will appear here. Start typing to show matching commands in the list, then highlight (Arrow keys) the command and use "Enter" to start it. "Menu -> Preferences -> dmenu"
The BunsenLabs OpenBox theme management script: "Menu -> Accessories -> BLOB Themes Manager"
When you have set up the looks of your desktop and windows how you like them, all the settings can be saved for future restoration.